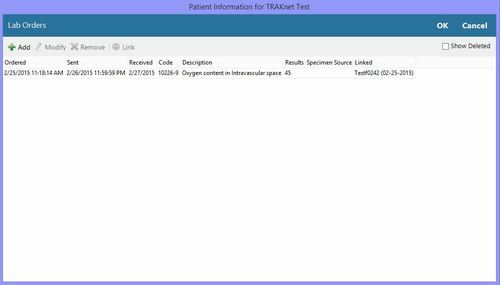 TRAKnet contains the capability to record and document Clinical Lab Test Results, primarily important for the completion of Meaningful Use in both Stage 1 and Stage 2. Lab results are documented on previously generated lab orders. To document a results, you must first enter the lab order itself, as documented on the CPOE page of this wiki. Once the lab order has been recorded, you will be able to modify those lab orders to record the results. This is found on the patient's chart under Orders > Lab Orders. This will open the Patient Information for Patient's Name Lab Orders window where the previously entered lab orders can be viewed. To modify a lab order and access the Results field, left-click on the lab order, then click Modify in the top of the Lab Orders window. This will open the patient lab editor window. The results field is meant to contain a numerical value about the lab results, but is a free-text field, and any data can be entered. When documenting results, you may also choose to enter the Normals value or set the Abnormal option to True or False. While this is no longer a requirement in Meaningful Use in 2015, the below videos are left archived as a demonstration for documenting patient lab test results.